Beautiful set of wood blocks for any art project, a fun way to spend a rainy day! 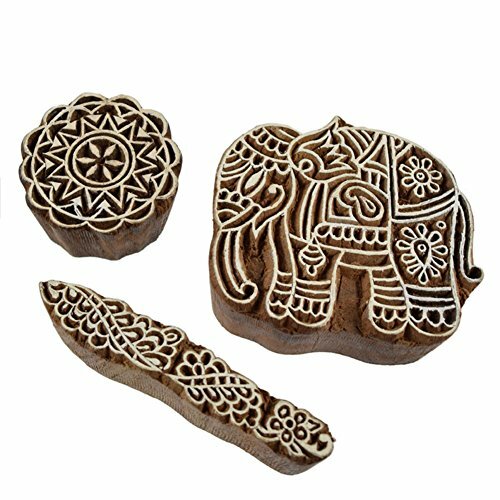 Set of 3 hand-carved shesham wood blocks provide exquisite detail to any paper or textile project. Perfect gift for any crafter, stamper or scrapbooker! Fun tools for art projects or making your own greeting cards. Perfect to use in journals too! Fair Trade allows artisans a fair wage and safe working conditions so they can support their families, while working in an environmentally sustainable way. Blocks come in cotton storage bag. Ink not included. elephant: 2 3/4"h x 3"w x 1"d. Fair Trade and Hand Made. If you have any questions about this product by Taraluna - Fair Trade, Organic & Green Gifts, contact us by completing and submitting the form below. If you are looking for a specif part number, please include it with your message.